A general view of Williams Creek. Barkerville - before the fire. Barkerville on the morning after the fire Sepr. 12th 1869 [corrected in a later hand to 1868]. Black Jack Claim, William's Creek. Calaveras Camp, Lowhee Creek Area. Camp At Slough Creek, Manager John Hopp's Office, Home And Stable. Canon [canyon] on Williams Creek. 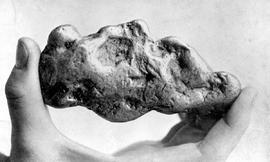 Gold discovered here in 1861. Cariboo. The Davis wheel at the claim on Williams Creek rotated by water power, for the hoisting of pay dirt out of the shaft, and the saving of manual labour. Chinese Placer Claim In The Cariboo. Chinese miners flume crossing the north fork of the Quesnelle River. 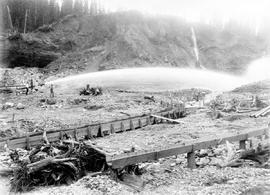 Clean-up of sluices at the Cariboo Hydraulic Mine. Cornish Pump With Steam Engine, Williams Creek. Ditch used to supply water for the Cariboo Hydraulic Co.'s mining operation. Dragon Creek Clean-Up; Two Bottles Filled With Recovered Gold. Drift mine, Lightning Creek, Cariboo Point Claim. Drilling A Shaft At The La Fontaine Mine At Lightning Creek. Eight Mile Creek; Thistle Claim, Showing Flumes And Workings.